Spinner rings are all the rage. 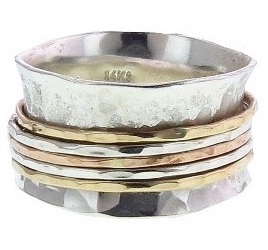 These rings have an outer band which spins freely around the ring. The action of turning the outer band is said to produce a special 'calming' effect which dispels anxiety and worries. Some say the design is based on ancient Tibetan prayer wheels. Make a unique sterling silver spinner ring in this four hour workshop. Materials will be provided by the instructor. Michele Throne makes her living as a full-time metalsmith and jeweler. She has a BFA from Florida State University and in a previous life, was a Montessori art specialist and teacher. Michele lives in the mountains and her work is inspired by nature and the human experience. To see Michele's work, visit her website, Sidhe Designs. Michele also sits on the Board of Directors of Boulder Metalsmithing Association. MAXIMUM NUMBER OF STUDENTS: 8. Students will be asked to sign a waiver.